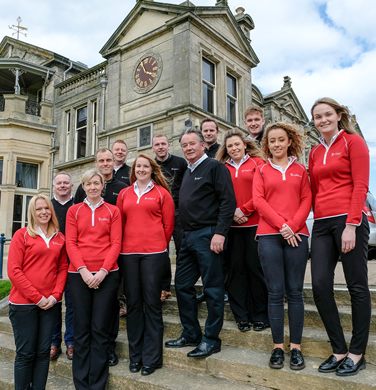 Established in 1985, for over thirty years we have been providing individually-tailored tours of the finest golf courses in Scotland, Ireland, England and Wales. It’s a very personal business to us, one that we take great pride in and have great fun doing; we’ve also been lucky enough to make lifelong friends of so many of our clients. To read what some of our clients have to say about us, please click here. We hope that you enjoy exploring our site. Please call or email us and we will prepare the golf tour you’ve always dreamed of. Our local knowledge and extensive network of contacts make us the ideal people to plan and deliver your perfect golf tour. If it’s your dream to play The Old Course we can also guarantee you that exclusive tee time. We’re experts in our field and our in-depth knowledge of the courses you’ll play, the restaurants you’ll eat in, and the hotels you’ll stay in will ensure that your tour with Links Golf St Andrews will be your best ever. Perhaps you’d like to treat a valued client (or two, or more!) to the tour of a lifetime – what better way to build loyalty than by enjoying a golf tour together? You may wish to reward a group of colleagues or incentivise your customers – what better way could there be to say thank you? We can arrange golf competitions, clinics, merchandised gifts, prizes and partner programmes. Often it’s the thoughtful little touches that people really remember. At Links Golf St Andrews we go to great lengths to create the most memorable golf tours. Firstly, our Golf Travel Consultants listen carefully to what you have in mind. We then prepare a golf tour and quotation for you that encompass your choice of golf courses, and we suggest the best accommodation and transport arrangements to suit your requirements. We’ll work on your itinerary until we’ve planned exactly the trip you’ve got in mind. Once you’ve given us the go-ahead, we secure tee times, request caddies or carts, reserve accommodation, book restaurants and arrange your transport. We prepare your golf tour proposal without any obligation, which remains subject to availability until you’re happy with every element. On receipt of your deposit we will confirm your reservations, and the balance payment is required two months prior to arrival. From our website, you will know roughly what we do: we organise the finest golf tours from our St Andrews offices, but why choose us to organise your golf tour. On behalf of our group, thank you very much for your excellent service and gracious hospitality that you provided us during our recent visit to Scotland.